Okay, back to the delicious peppers! The original recipe called for brown rice, which I chose to substitute with quinoa since it is packed with protein and deliciousness! This was my first time making it and it turned out delicious! Just beware- 2 cups of uncooked quinoa turns into like... 5 cups cooked quinoa (the recipe only calls for 2 c. cooked, so I have TONS of leftovers). Lesson learned. I also used closer to 3/4lb. ground turkey breast (make sure you get turkey breast, otherwise it is mixed with white and dark turkey meat). You could even cook another pepper (5 total? ), as I had a good amount of leftover "mix". -Preheat the oven to 400 degrees. Cut the peppers in half, cut the membranes out, and lightly coat the peppers with olive oil and roast in a baking dish (9x13 worked great for 4 peppers) for 20-25 minutes (until cooked through). Remove from the oven and allow them to cool so you can handle them. -While the peppers are roasting, cook your ground turkey and onions. Also cook/boil your quinoa or rice! Add cooked rice, black beans, corn, cooked meat, taco seasoning, and salsa into a bowl and mix. -Spoon mixture into each half of the peppers, put them back in the baking dish, and bake for another 15-20 minutes. If you are adding cheese on top (I did not), sprinkle the top with shredded cheese right before removing from the oven! These were so easy to make, and still tasted great as leftovers! I wouldn't do anything to change the recipe. Everything in them is so healthy, you can't feel guilty about eating these for one second. Can't wait to make them again! 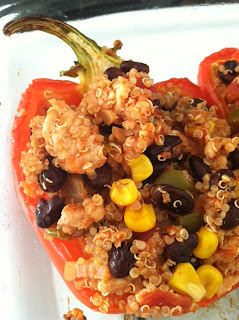 With this recipe I will be fit for success...great blog! 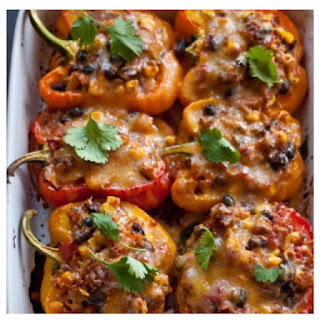 This looks like a great recipe -- I love stuffed peppers! These were sooo good! I seasoned my meat a good bit - with Worcestershire, salt and pepper, garlic and onion powder, oregano, and cayenne. To make it healthier, I cut out the rice and used a pound of meat, and I made my own taco seasoning. I have a good bit of leftover stuffing, and am going to use it to make taco salads with avocado dressing this week!